We had another successful volunteer afternoon yesterday with another good turnout and even a couple of new volunteers. 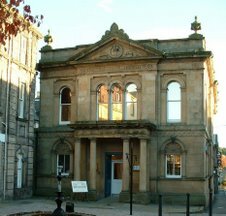 The afternoon was taken up with continuing to dry-mount the labels for the display cases, searching for items for the High Street History Display at Forres Library beginning on 18th February, working on the large High Street plan and producing more packs of notelets. Thankfully new member Marjorie found an error in the cards before it was too late and then she also found out that the cellophane bags I'd bought for them were the wrong size. This was despite me being told by the shop keeper they would do the job! Looks like I'll be back to shopping from the internet. Alasdair, Senior Museums Officer, came along to offer support if needed, and to do some work but he ended up perched in a corner of the old office as there were so many of us there was little free space! Those who braved a rummage in the store with me enjoyed the experience and we managed to find some great objects for use in the High Street History Display. If you want to see them for yourself you'll have to come along to the library from 18th February to 3rd March. Teatime was a bit easier this week as we got more mugs (the drinking from kind) but unfortunately no home baking this week. Next week should hopefully see us finish up work on the display and dry-mounting the labels so after that I'll need to find some new things to keep us occupied. Shouldn't be difficult as I've got quite a list!